The defending Sac-Joaquin Section Division V Champion Bear River Bruins kickoff teh 2018 season tonight in South Lake Tahoe. Back row from left: Dylan Bergez-Scott, Jared Baze, Jonny Carrillo, Calder Kunde and Tre Maronic. Front row from left Sam Davis and Hunter Daniels. 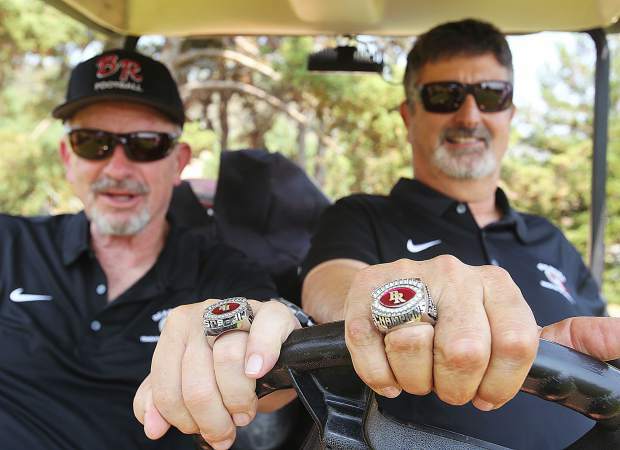 Bear River co-head coaches Terry Logue, left, and Scott Savoie show off their Sac-Joaquin Section Championship rings. From left: Dylan Bergez-Scott, Jared Baze, Jonny Carrillo, Sam Davis, Hunter daniels, Calder Kunde and Tre Maronic. 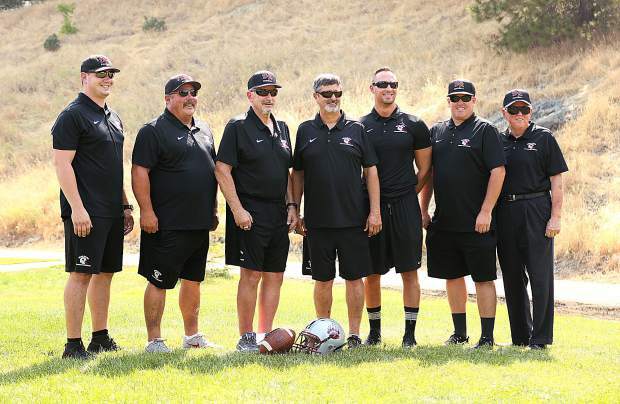 Bear River's coaching staff puts on smiles for picture day. 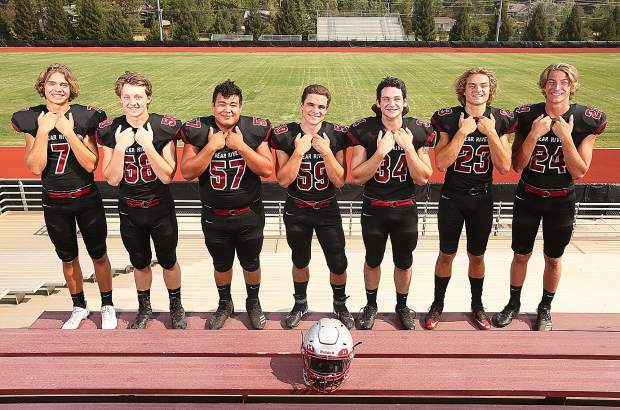 The Bear River football team has won Sac-Joaquin Section championships twice in the last four seasons, and the roar of the Bruins remains strong. This year’s crop of gridders are hungry and focused as they gear up for the start of the season. In 2017, the Bruins went 10-4 overall and reclaimed the Sac-Joaquin Section Division V crown. After reaching the playoffs with an overtime win over Center in the last week of the regular season, Bear River knocked off playoff teams Capital Christian, and Ripon before topping rival Colfax in the title game to earn their third section championship in school history. 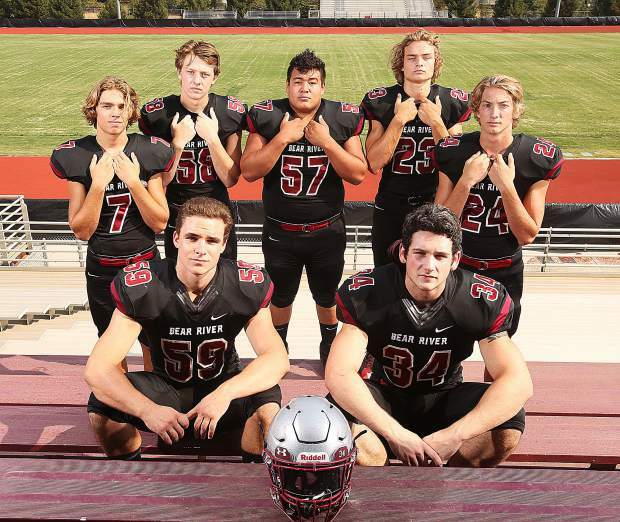 This year, Bear River’s talented 23-man roster looks to silence any doubters and deliver as it has done so many times before. 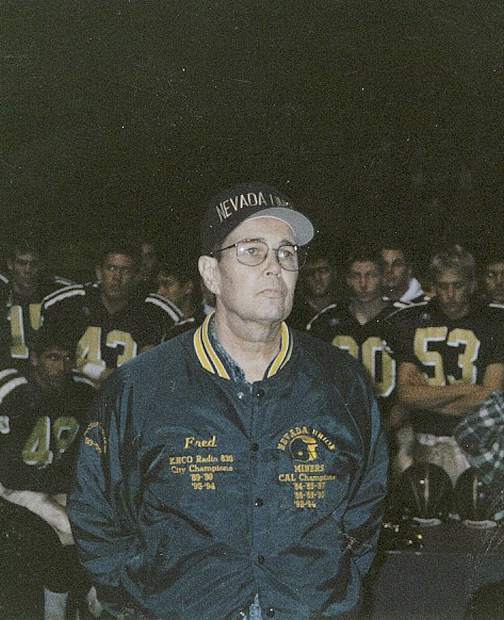 But of course, it wouldn’t be Bruins football if there weren’t a few unexpected twists along the way. Last season, the Bruins averaged 112 yards passing per game led by senior quarterback Luke Baggett, as the team hauled in 14 touchdowns through the air. Taking the snaps this year for the Bruins will be senior Calder Kunde, who got some reps last season passing 14-for-20 for 130 yards with two touchdowns. Also sharing some of the quarterback responsibility will be junior Tre Maronic, who was 2-for-2 for 48 yards and a touchdown last season. Maronic, however, will be starting at halfback, looking to give the Bruins a boost in the running game. For the first time in 14 years, Logue will be taking over as the team’s offensive coordinator. The change comes as much needed assist to Savoie, who has a lot more than just X’s and O’s on his agenda this year as Bear River’s AD. Through the trenches Bear River rushed for 2,565 yards in 2017, led by then senior fullback Austin Baze. As a squad, the Bruins averaged 183 yards per game and plowed in for 32 touchdowns. While Bear River graduated several running backs from last season, much of the offensive line is back. Behind Bear River’s front line will be Maronic trying to find the seams. He finished with 66 carries for 416 yards and one rushing touchdown last season. Maronic also proved to be a talented pass catcher out of the backfield. Kunde offers a dual-threat at quarterback with the ability to run as well. He took 29 carries for 222 yards and scored two touchdowns out of the backfield last season. At full back, the Bruins have a few options with seniors Austin Slining and Hunter Daniels, and junior Zach Fink. Backing up the quarterback position will be junior Colton Jenkins. The Bruins had a few good options at wide receiver last season and they all kept opponents on their toes. Kunde led the team with 30 catches for 484 yards and three touchdowns He was followed by Moronic with 24 catches for 418 yards and six touchdowns. Senior Dylan Bergez-Scott is poised to have a breakout season this year, following a junior season in which he had 17 catches for 168 yards and a touchdown. Bear River’s ability to shut down opponents and create turnovers has been a defining characteristic over the past several years. That trend needs to continue if the Bruins hope to hoist up another banner. Defensively, Bear River stood tall and brought a relentless pressure all season long in 2017, tallying 21 sacks and giving up 18.2 points per game. It’s secondary nabbed 13 interceptions while the defense pounced on 11 fumble recoveries. Graduated senior Travis Carpenter led the team with 127 tackles last year from his middle linebacker position. Filling in his shoes is senior Daniels. Also looking to plug up the middle and get after the quarterback will be Davis, who wrapped up six sacks last season and Nix, who added a pair of his own. Holding down the fort in the defensive backfield last season, Kunde grabbed four interceptions and Moronic had two. Bear River reached a new plateau for its program in 2017 by making the school’s first ever trip to the NorCal regional state championship bowl game. This season that opportunity is up for grabs once again, although the playoff picture looks a little different. With the section shaking things up this season with league realignment, the Bruins will no longer have to face schools such as Placer and Lincoln, which have more than twice Bear River’s enrollment. 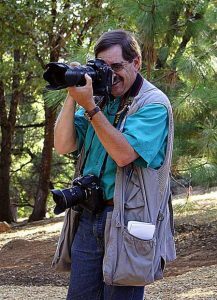 With Placer and Lincoln out, now part of the Foothill Valley League, the PVL welcomes in Lindhurst and Marysville to join Bear River, Center, Colfax and Foothill. The Division V playoff bracket will also be expanding from eight teams to 12 this season, where the top four seeds receive a first-round bye. 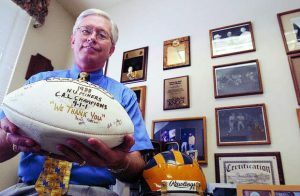 A minumum of two league wins is no longer required, however, the CIF selection committee will consider a wide range of factors. The Bruins are Tahoe-bound in their season opener, taking on the Vikings from South Tahoe High School at 7:30 p.m., tonight.